Integrated ecommerce ERP is essential for business’ to grow in this ultra-competitive marketplace. By making sure all of your ecommerce and logistical functions connect, your customers and your business profit. 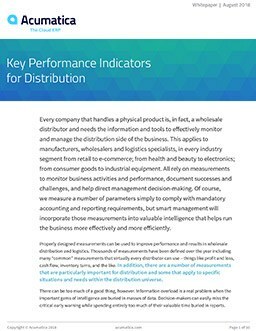 Learn how in Acumatica’s new Whitepaper. It is rare to find a business today that doesn’t use online sales – or ecommerce – as part of their selling strategy. How else can companies reach the most customers with the least amount of effort? There’s no other option that provides consumers with the ease-of-use and functionality as getting on a website does –click a few buttons and voila! The product is bought and heading directly to you without you actually having to leave your house. I consider this an extremely easy and enjoyable shopping experience. When the customer is happy, your business reaps the benefits. Studies show that customer experience will overtake price and product as the key brand differentiator by 2020. And an imperative factor in customer satisfaction is making sure the behind-the-scenes functions within your integrated ecommerce ERP of choice are integrated. A free copy of the Whitepaper is located here; I hope you’ll take a moment and read it for yourself. But before you do, let me tell you a story about one of Acumatica’s clients who knows all about successful integrated ecommerce ERP. In 2002, Marc and Robert Schlachter founded their company, SHOEBACCA . You may be able to tell from the company’s name that they sell shoes but their story is about more than just their product. It all started with selling discounted name-brand athletic shoes in local markets. They then became resellers on eBay and quickly catapulted themselves into ecommerce in 2007. Their first customers were low-income families and as their business flourished, they sent shoes to third-world countries – something they had done from the very beginning. With a heart for serving their community and contributing to various charities, SHOEBACCA’s five-year success story is wonderful to hear and not surprising. And because of their rapid growth, the SHOEBACCA team found themselves needing to find a solution for integrating their disparate ecommerce, warehouse management, and business intelligence reporting systems. Their search led them to Acumatica and to the benefits of our flexible, integrated ecommerce ERP. Their implementation resulted in the ability to focus on providing shoes and not on IT and development as well as numerous other benefits. If you want to read more of SHOEBACCA’s inspiring story and about those other benefits please go here. “Because of its flexibility, Acumatica would be a great asset to any business trying to expand an ecommerce platform,” says SHOEBACCA’s Director of IT Thomas Finney. Improved data management and easier, more accurate tracking and reporting of financial data. Enhanced integration with ecommerce websites. Automated processes save management time and effort. Increased inventory visibility and replenishment adds to customer satisfaction and reduces carrying costs. Our new Whitepaper goes on to say the key to success is “seamless merging of ecommerce with other channels throughout the entire customer experience.” Whether a customer wants to purchase your product via a website, a mobile device, or a traditional store – omnichannel shopping – they want their experience to be consistent and efficient. “Omni-channel success…requires strong and fully integrated supporting functions that treat all channels with equal efficiency and effect,” the Whitepaper explains. Acumatica is an omni-channel ERP provider utilizing an integrated approach between the website, mobile device or storefront and the fulfilment, return, financial management, analysis, feedback, sales, marketing, product design, customer relations and logistics processes. The title of Acumatica’s new Whitepaper says it all. Omnichannel retail is becoming a necessity in today’s marketplace causing companies to turn to solutions such as Acumatica. The integration capabilities of Acumatica simplify ecommerce by providing accessibility to all their applications in a single dashboard. Read the Whitepaper for even more insight into the correlation between tighter integration and the best ecommerce. The team at Acumatica and I are happy to help you dive deeper into what the best integrated ecommerce ERP and omnichannel ERP for your needs looks like. Give us a call or message us – your business’ success in the ever-expanding ecommerce world is important to us! Our technological journey has been a bit crazy and I imagine most startups go through this. We’ve been happy to land on Acumatica. It’s robust, it’s flexible, it’s simple but it also has an API so as you need to connect into it, there’s an ability for that as well.